Combined 32/64 bit Menu entries where possible to reduce clutter. 01/18/11 – Version 1.8.2.5: Fixed Puppy 4.3.1 Entry, Browse now opens to the directory the tool is run from. 01/17/11 – Version 1.8.2.4: Added Panda Safe CD "Standalone Antivirus Scanner". IMORTANT NOTE: Ensure that your USB drive is fat16/fat32 formatted, otherwise Syslinux WILL fail and your drive WILL NOT Boot. Feel free to inform me of any updates to listed Live Linux distributions, and I will do my best to add support by updating UUI to support them. A Linux based method is planned for those who prefer not to use Windows. 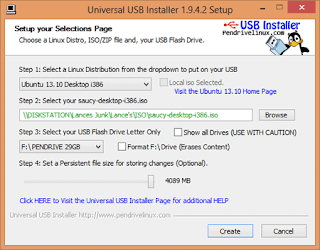 For now, visit the "How to install Linux from a Linux CD" section for Live CD based USB Linux installation tutorials, or use another Linux USB Creator. IMPORTANT: When browsing for an ISO, UUI will only display ISO Files that match exactly what the tool is asking for. For example, if you chose to install Ubuntu 10.10 Desktop i386, you should not expect the tool to display your ubuntu-10.10-netbook-i386.iso as you have not chosen to install the netbook variant. This tool does not support installing and booting from multiple Linux Distributions. Only One Distribution can be installed at any given point in time. However, we do offer a MultibootISOs USB Creator for this purpose. To try an unlisted ISO, for example "Ubuntu 9.10", use one of the the last two options in Step 1, "Try Unlisted Linux ISO". Please inform me of unlisted "Linux ISOs" you get to work via these options! How do you copy DVD to USB drive?